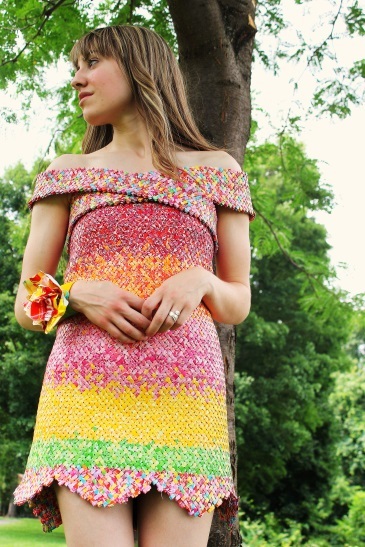 This Pennsylvanian satisfied her sweet tooth and eye for fashion by upcycling wrappers into a posh dress and wrist corsage. Emily Seilhamer holds a special place in her heart for the fruit-flavored candy Starburst. It's how her husband won her over on their first date. He knew she had just gotten her braces off and could finally eat the famously chewy candy, so he came equipped with a package for the two of them to share. It wasn't her first time to taste Starburst, but "it was definitely the most memorable," she said. From then on, Seilhamer's then-boyfriend would always bring Starburst on their dates. It started not only their love story, but an affair with the candy brand that culminated in Seilhamer crafting a dress entirely out of the colorful wrappers. Why do you love Starburst? They not only taste good, but the wrappers are super colorful! 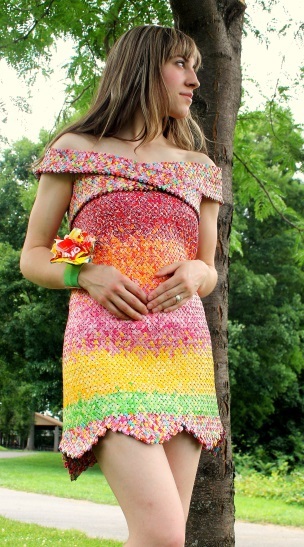 They're perfect for upcycle projects like my Starburst wrapper dress that recently went viral. How do you show your love for Starburst every day? 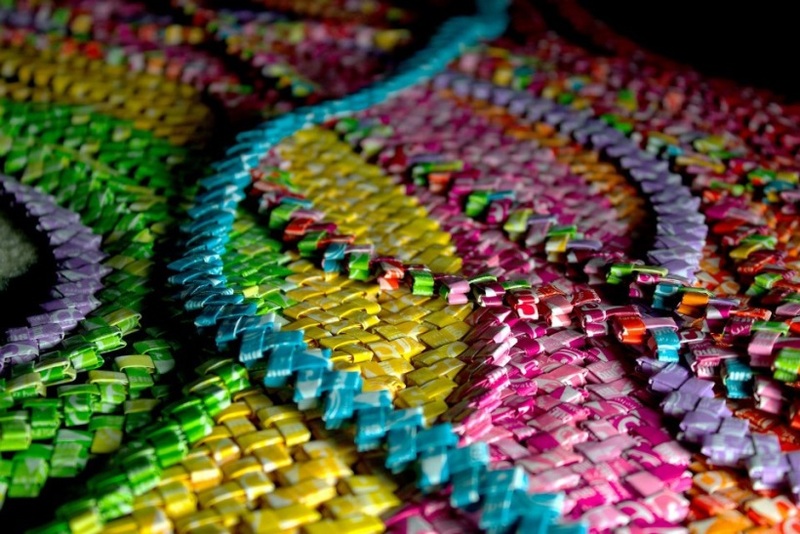 I make wrapper chains after we eat the candy and create cool upcycled art. I'm currently in the process of saving wrappers for a purse! What's your coolest piece of Starburst swag? 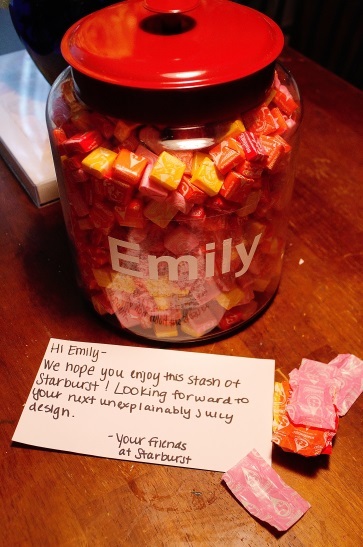 Most recently, the Starburst sent me a personalized giant jar of Starburst candy as a thank you for making the dress out of their wrappers. Someone commented on the photo I posted, saying, "You know you're a star when Starburst sends you your own personalized stash...right?!" Maybe not a star, but definitely a superfan! 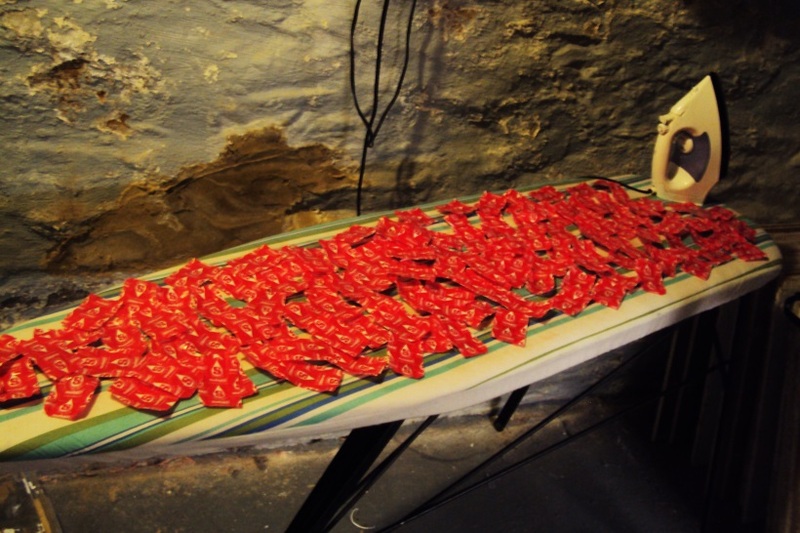 What's the craziest thing you've done for Starburst? 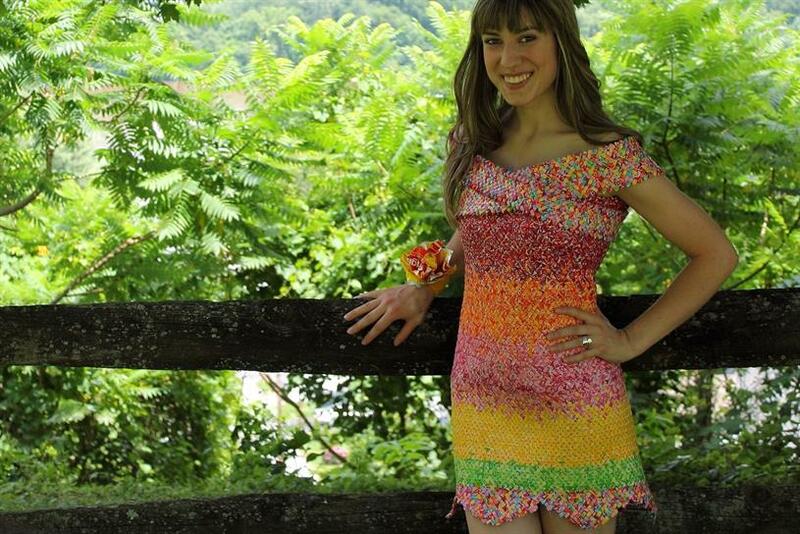 I saved wrappers for four years and created a multicolored rainbow dress for myself. It's fully functional and smooth like snakeskin—pretty heavy though, so I don't wear it too often. It now serves as a great conversation starter in our home! How often do you interact with Starburst? 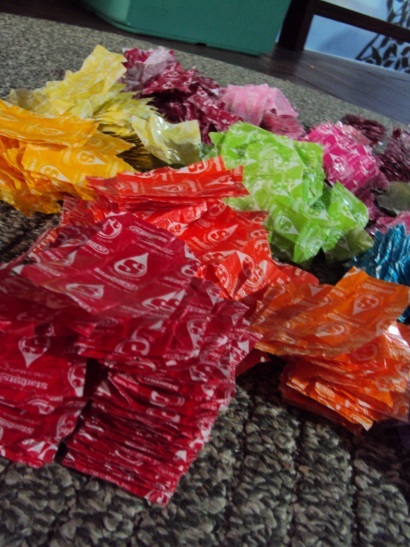 Currently, we are on a steady diet of Starburst, so I can make that purse I mentioned. We sometimes have to get creative with how we eat them. My favorite is cutting them in fourths and using them like chocolate chips in cookies! If you could change one thing about Starburst, what would it be? One challenge I had was the company discontinuing the colors I was using in my design. I wish the super bright blue and green wrappers were still out there. They might be, but I haven't seen them in Pennsylvania for a while, at least. But that's okay; the candy themselves taste amazing, so they're definitely doing something right. Are you satisfied with the level of engagement you've received from Starburst? Yes! They even gave me a shoutout on Twitter recently. What's the one thing that would make you disloyal to Starburst? I'd become disloyal if their wrappers were all gray, white or some non-eye catching color. Then, I wouldn't be persuaded to save the wrappers. Twizzlers and Disney, I guess, since we are on the topic of candy. 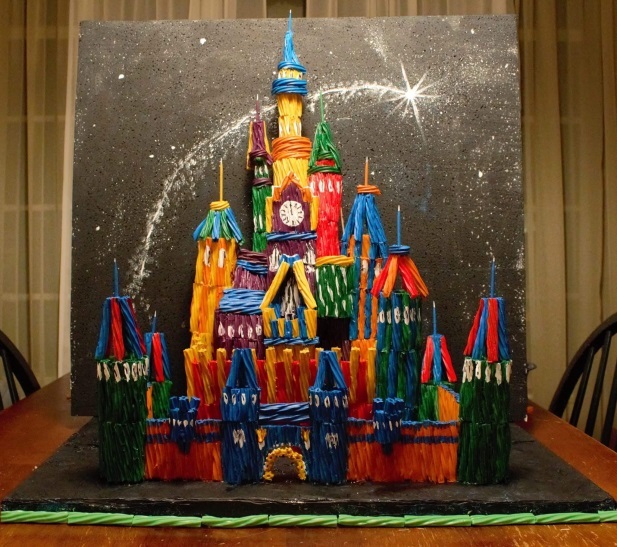 I just recently made a Disney-inspired castle out of Twizzlers.